Every day gives us new opportunities for fun and adventure. 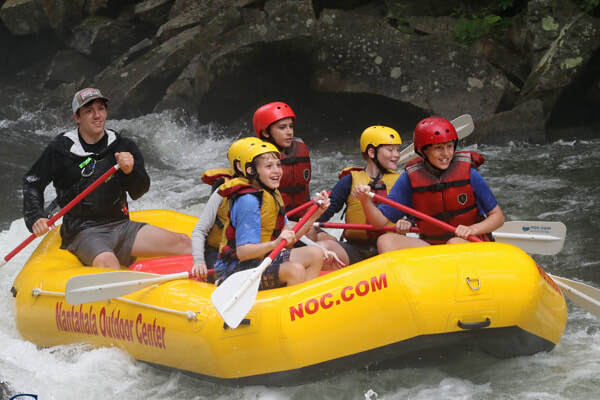 Rafting on the Nantahala River in North Carolina in 2017. No two days are ever the same and that's just one of the ways we're different from an ordinary camp experience. If the motel has a continental breakfast, we announce what time that is served and explain that they can eat breakfast during that time frame and to be ready to leave at a given time. If the motel doesn't have a breakfast, we will go to a restaurant for breakfast which will mean getting started a little earlier. We are usually ready to start our day's activities around 9 each morning but even that varies depending on what we have planned. Our day will be filled with usually two or three activities and those change each day. We might have a morning hike that includes a trail lunch and then come back into town for miniature golf or to visit a museum. Some days we might take a bike ride (on rented bikes), a short horseback trail ride, a rafting or tubing or canoeing trip, or go geocaching. On some days we might offer the chance to split up into a couple of smaller groups with one set of boys and leaders doing one thing and another set participating in a different activity. In all cases the days are filled with activities - some lasting a few hours and others all day. If we're going to be out during lunch time (and we usually are), then lunches are a trail lunch the boys will pack to carry with them. If we're in town at lunch we'll usually eat in a fast-food restaurant. Our day activities usually wind up around 6 in the afternoon and we'll our make our way back to our motel where the boys can relax, go swimming in the pool (supervised of course), and get cleaned up for dinner. All of our dinners are in sit-down restaurants where the boys get to choose from the menu. After-dinner activities will depend on what time we're finished with our meal and sometimes that just means coming back to the motel to get ready for bed while at other times we might have an evening activity like a rodeo, an outdoor drama, a festival, or something else we find that looks interesting. Eventually it's bedtime and we're usually quite ready by then. The next morning it starts over with different activities and different scenery. Some of our activities are planned well in advance such as those requiring reservations. Others are planned a day or two before and still others might be spur-of-the-moment opportunities we just happen upon. We love the unexpected! Parents and friends can check out our blog with photos and activity news just about every day to see what the boys have been up to. Click to check out some past blog entries. On our shorter trips (usually 7-10 days) we'll often base in only one town which eliminates the packing and unpacking. Each day might find us driving ten or twenty miles in various directions to our chosen activities. On our longer trips (usually 10-14 days), we will often split the time between two or sometimes three towns. The Europe by Eurail adventures are a completely different type of experience. The Europe by Eurail trip for 2013 is 20 days long and we change cities every two to three days depending on the what the boys want to do. Click for the Frequently Asked Questions page that might answer more of your questions.